Mostly like the first issue I put out, this is generally a collection of the posts I just did about Tumwater. But, there is some new material as well to tie it together. 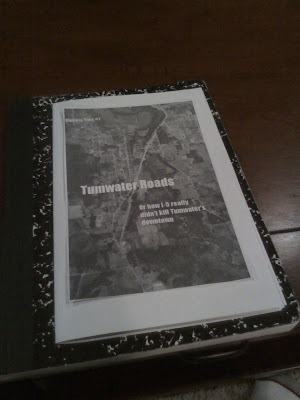 You can download it here: Tumwater Roads, or how I-5 reall didn't kill Tumwater's downtown. When I put it together, I did it in a manner so it could be printed out and then folded in half, stapled and then read. So, keep that in mind after you take a look at your downloaded version. The downloadable version is also pretty choppy because of its scanned nature. If you want a clean version, taken directly from the scissor cut and paste master, just let me know, and we'll arrange me getting one to you.